What child doesn’t love pretending to be a princess or a prince? It’s as if all children secretly know they are born to be royalty. Wouldn’t it be wonderful to turn fantasy into fact and help kids understand their royal standing in the Kingdom of Heaven? When kids see themselves as royal subjects, their sins as dragons, and Jesus as the prince who risks his life to save them, the story of the Bible comes alive! We’ve designed a month-long celebration of royal experiences for kids ages 4-12 to introduce them to their Father the King and Jesus the Crown Prince! 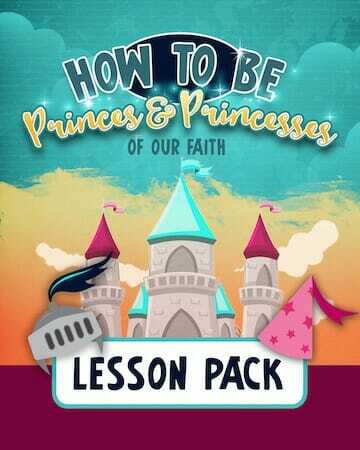 We have included everything you need to teach kids about being Princes & Princess of their Faith with conviction! We provide four complete 1-hour lesson plans, you can teach them all in a row to span an entire month (big impact!) or split them up and do one a quarter- it’s up to you! For each week lesson we provide supplementary crafts, games, and royal snack ideas. After a month of playing royal subjects, students should understand the story of the Bible with amazing new insight and great enthusiasm! Lesson 1: What is Royalty? Kids learn that they are actually royalty if they belong to Jesus and how the kingdom of Heaven is better than any fairy tale kingdom—because it’s real! In the craft will discover four types of crowns that we can look forward to seeing in God’s kingdom. Kids will hear a suspenseful tale of a prince and princess kidnapped from their father the king–and the crown prince has to save them. The king is God; the crown prince is Jesus, and your students are the prince or princess! The craft, game and snack all reinforce how we have to help the crown prince slay the dragons of our sins in order to get back to our Kingdom. A royal party is the setting, where kids begin to learn how princes and princesses really act. They’ll learn how to take royal candy for themselves in ways the crown prince would take it—understanding that the first will be last, and the last, first in his royal kingdom! Lesson 4: Uh-Oh, Don't Sit Thyself There! It’s a second lesson in how royalty behaves, this one having to do with making yourself look important versus making another person feel important. Will our royal students know by now not to sit at the places with the biggest cupcakes? Every Prince or Princess needs a crown! The Bible contains a lot of references to crowns that Christians can earn and/or look forward to. Crown of Glory (for finishing the work God gave you to do). 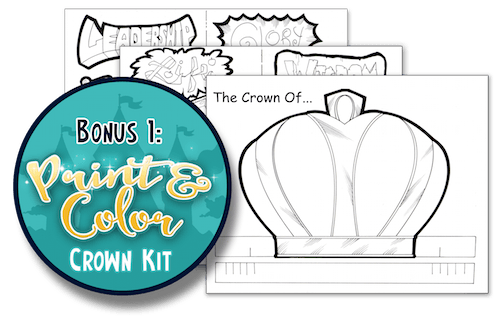 Kids can learn about the various crowns they can earn while they color, cut & decorate their crown to wear during the lesson series. The message is powerful: Heaven's crowns are earned. 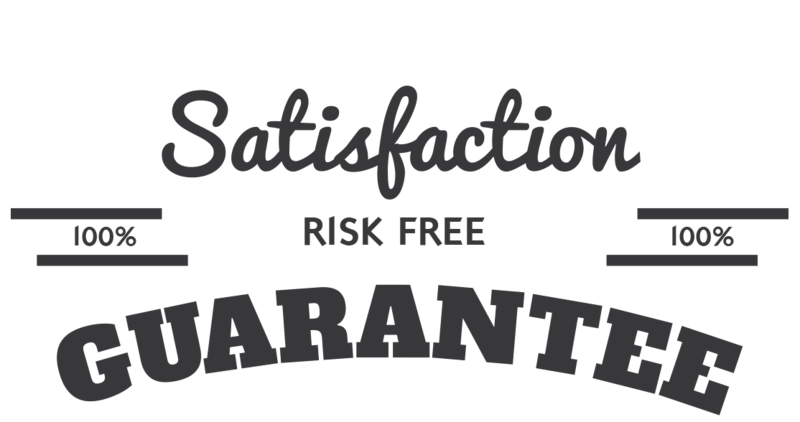 Use our printable 8.5 X 11 certificates to award your "Princes & Princesses" upon completion of the lessons! Print off as many copies as you need year after year! Simply fill in the blanks! This is a fabulous way for children to publicize their achievements on the refrigerator and generates terrific "car conversation" with parents and their kiddos. Print Out As Many of the Crown Kits & Certificates as You Need. Year-After-Year. 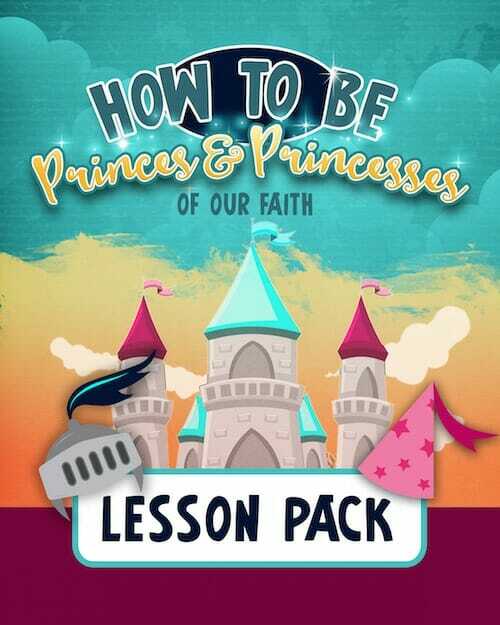 We are so sure that you will love the "How to Be Princes & Princesses of Our Faith" Lesson Pack that we are offering an unconditional 100% money-back guarantee. YES, I want in! 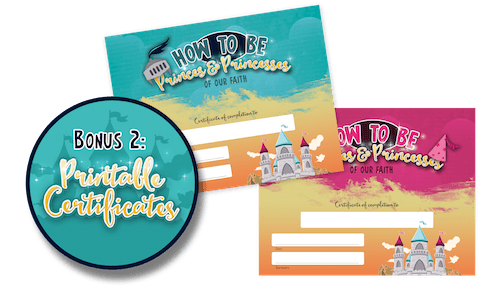 I want access to the "Princes & Princesses of Our Faith Lesson Pack" PLUS the Bonus Crown Kit and Printable Certificates. Please give me INSTANT access right now! Just $7 gets you instant digital access so you can start using these activities right away!